“The Mummy” had originally been made in 1932 from a screenplay by John L. Balderston, with Boris Karloff in the title role. Following the success of “Dracula” (1958), Universal were more than happy to hand over the script of their old classic to Hammer for similar treatment. 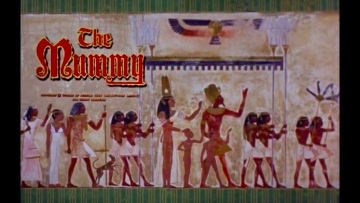 The scene in which Peter Cushing plunges a spear right through the body of the mummy was not in Jimmy Sangster’s original screenplay. It was added at Cushing’s suggestion after he had seen the artwork for the film’s poster, which showed a beam of light shining through a hole in the creature’s stomach. Actor Eddie Byrne was no stranger to horror films. In 1958, he was in Robert S. Baker and Monty Berman’s “Jack the Ripper” and later made two movies for Tom Blakely’s Planet Films – “Devils of Darkness” (1964) and “Island of Terror” (1966, with Peter Cushing and directed by Terence Fisher).